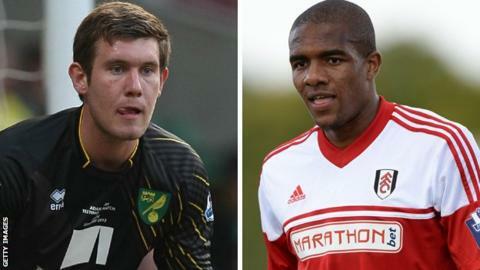 Aston Villa goalkeeper Jed Steer and Fulham defender Stephen Arthurworrey have joined Yeovil Town on loan. Both players have signed for the Glovers until 31 January. Steer, 22, was a Norwich player when he had his first spell with Yeovil in 2011, before he agreed a switch to Villa last summer. Arthurworrey, 20, spent the second half of last season on loan at Tranmere, making 17 appearances, and has featured once for his parent club. Yeovil have already brought in right-back Jordan Clarke on loan from Coventry this week, with Aaron Martin moving the other way. Glovers defender Jakub Sokolik has also been sent to Southend, as part of manager Gary Johnson's reshuffle. However, Johnson now has six loan players on his books meaning one will have to be left out of Saturday's squad to face Chesterfield.